Help Me! 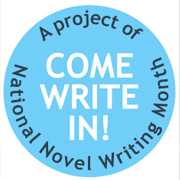 Become a NaNoWriMo Sponsor! Donate! Zoe Amblers NaNo Fundraising Page! This year I am working as a Municipal Liason on NaNoWriMo. I would love for you all to clicky the link above and give whatever you’d like or can! As you all know, NaNo is a project dear to me, I love participating and I love rallying the others. I plan on attending The “Night of Writing Dangerously” in San Fransico, however, this also depends on the help of you all. I must raise enough through fundraising to ensure my seat!! The Deadline for this fundraiser is August 31. I know, I know…not a lot of time. But please, any little bit will help and ensure my spot. There is a static page for this on http://zoeambler.com for those who wish to donate later, or multiple times! This entry was posted in Camp Nanowrimo, Challenge, Contest, Favorite Things, Fundraising, Help, Motivation, NaNoWriMo, People, Promoting, Promotion.